Remember: we LOVE creating custom items! If you don't see anything here that you love, CONTACT US with your requests. These custom embossers are great for creating all kinds of your own personalized items! 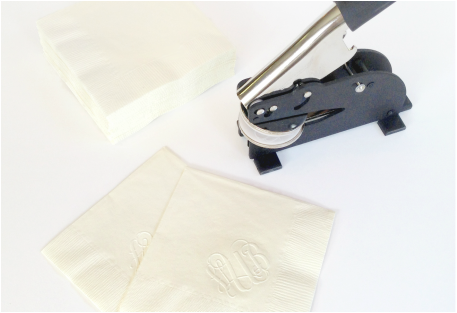 Let us design a set of custom monogrammed embossing plates that you can use to create your own embossed cocktail napkins, notecards, envelope flaps, gift tags, calling cards, etc! Pricing varies on imprint size, beginning at $65. CONTACT US for a quote tailored to your specific requests!